Update (06.24.2017): The votes are in. 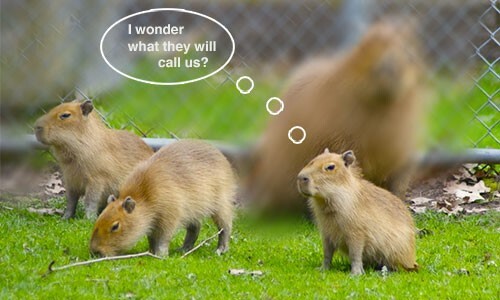 Toronto’s ‘capybabies’ will be named Alex, Geddy and Neil! For more, click HERE. Rush's reverence in their home city of Toronto cannot be understated: the power trio have recently been awarded the Key to the City and have a city park named after members Geddy Lee and Alex Lifeson. Now, the group have a chance to be further immortalized in having a trio of capybara cubs named in their honour. An online vote opened by Friends of the High Park Zoo lists "Alex, Geddy, Neil" as a combination of names for the cubs, who were born earlier this year. The poll says that "submissions from the public ranged from local landmarks to popular trios and adorable nicknames." The current list of voting options was culled from reviewing more than 12,600 other names, and includes other combinations such as "Mocha, Chino, Latte," "Babyface, Floyd, Dillinger," "Peanut, Butter, Jam" and "Snap, Crackle, Pop." The voting period closes on June 19, so get your votes for Canada's power trio in here. The zoo is also accepting donations to shore up the living conditions capybaras, which you can find out more about here. -Exclaim!